Missed the Americas Cup, the Champions League, so that in 2016 the most frustrated year of Messi career, but for Barcelona to win three trophies, led the Argentine national team for three consecutive years reached the international championship and enough to reflect the excellent state of Messi. Messi status is excellent, but its team has repeatedly lost in the key battle, the problem is enough to make Enrique, Ba Wusa ponder. In terms of data, Lionel Messi in the 2016 61 appearances into 58 goals and 32 assists, averaging 0.95 ball into the 1.47 ball, which means that as long as Messi played, his team will be 1.5 goals Of the advantages of lead. In his career, Messi in 2016 to participate in the number of goals after 2012. Compared with Lionel Messi, C Lo's sent a lot of data, the Portuguese striker 55 appearances to participate in 68 balls (51 balls 17 assists), less than Messi a full 26 balls. In honor, Messi in 2016 won the La Liga, King's Cup, the Spanish Super Cup, also with the Argentina national team reached the America's Cup final. Not only that, Messi played a very important role in the four events in the Centennial Cup, Messi participated in the Blue and White Corps 18 goals in 9 goals, accounting for 50% of the team goals. In the Spanish Super Cup, Messi scored a goal and 2 assists, 60% of the team participated in the goal. Need to emphasize that, in the World Cup, European Cup, America's Cup this international competition, luck is essential, for three consecutive years reached the international competition finals, then reflects the blue and white army's strong strength. Messi also created a lot of magical record in 2016, in the Champions League, Lionel Messi than previously maintained by the UEFA Champions League group goal scoring record, and almost broke the C Lo to create the Champions League single-season scoring record. In the Primera Liga, Lionel Messi became the first player to enter the history of the Liga 300 ball, while in the Argentine national team, Messi also surpassed Batistuta, Argentina became the best national team striker history, in addition, Messi also A substitute in the official game to complete the hat-trick of the Argentine players. Missed the Champions League, the Copa America, and the team on Messi too dependent on. Harvey, Alves left the team, Iniesta (data) suffered injuries after another harassment, Enrique adjustment of the tactical system, so Barcelona increasingly rely on Messi. The existence of MSN to Barcelona like to use quick counterattack, the importance of midfield players in the lower, and Messi is more to assume the responsibility of the core organization. In 2016, Messi has 32 more assists, in his career after the 2011 created 36 assists record, you know, Messi played 70 times in 2016, only 60 appearances. In the Argentine national team, Sabella once to build the Messi, Dimaliya, Aguero, Higuain composed of Fantastic Four, Dimaliya in the 2014 World Cup reached the pinnacle of national team career. But in Martino, Bausa under the coaching, the magic four is no longer magical, Dimaliya, Aguero state is no, Higuain is often sinners, Messi can only support the Blue and White Corps attack. Barcelona against Atletico Madrid, Real Madrid and the Argentine national team against Chile, Brazil's performance is sufficient to prove that once Messi poor state or opponents have targeted man-mark, the team will be helpless. And Messi, C Luo is more like a striker, and Real Madrid, the Portuguese national team of its dependence is also reduced. Whether it is against the Atletico Madrid's Champions League final, the European Cup final in France, or the European Super Cup final Seville, C Lo or absent from injury or no performance, but this did not hinder the ball Team won. 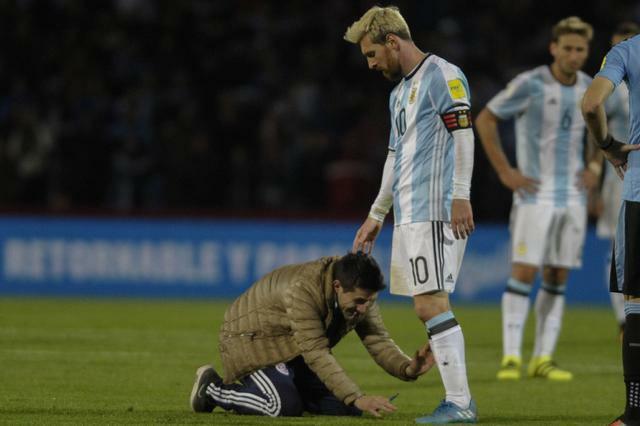 In 2016, Messi has an excellent performance is an indisputable fact, but even if you as Mr. Golden Globe, Messi also need team-mate support, whether in Barcelona, ​​or in the Argentine national team are so.